If you've optimistically popped a Leica M10-P down on your Christmas list, but know in your heart of hearts you're unlikely to find one under the tree on December 25, we might have the answer. Leica Store Miami has started selling Leica M camera Lego kits for $45 (around £35 / AU$63), with two versions available, one black/grey and one brown/grey. Each camera measures 7.6 x 5 x 3.1cm (3 x 2 x 1.25 inches) and weighs in at 56.7g (2oz). These are unofficial Lego kits and do require assembly, while they also come without instructions. Great if you want to set yourself a little challenge over the Christmas break, though there's obviously a risk that it could turn out looking more Zenith than Leica. 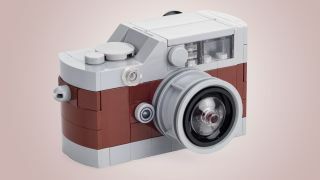 If you're struggling, you can find instructions for a similar Lego camera at Chris McVeigh's building guides, which should get you pretty close. McVeigh also has building guides for other cameras, computers and more tech items, with easy to follow instructions and a list of parts needed.